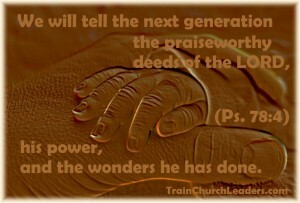 What do you hope to hand on to the next generation to help them be the Church? What is it that you really want them to know? Will you have more than a policy manual to give them? Think about it: What will impact the next generation the most — a policy manual to tell them how to operate — or record of a praiseworthy God who has exhibited His presence and power in your midst? As we will note in the next post, we need to keep church policies in perspective so we don’t let them take on a life of their own and become all we have to pass on. While it might be beneficial to hand them policies as a guide for what we have found helpful, that’s not going to be sufficient to make them want to be a part of the Church. The real appeal is an Almighty God who is great enough to make a difference in their lives now and for eternity. ← Previous Previous post: Spiritual Gifts Listed on Job Descriptions?